Valve's Gabe Newell has slammed copy protection on computer games – accusing some digital right management of 'wrapping negatives' around a user's experience. Valve are one of the leading lights in gaming, and Newell's comments at GDC follow Ubisoft's decision to install a copy protection that requires an always on internet connection for the games to run. "One thing that you hear us talk a lot about is entertainment as a service," said Newell. Newell also made some bold claims around Portal 2 – stating that this is Valves' best game ever. The original Portal was a massive critical success, introducing one of computing gaming's most memorable characters in GLaDOS and a fiendishly addictive series of puzzles. 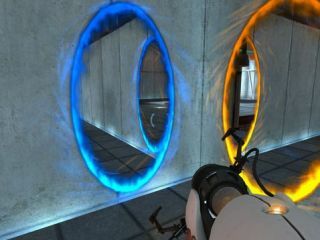 "Portal really seemed to resonate," explained Newell. "We got the signals that we wanted - this is what people liked; this is what people didn't like. "And to us, it was like, 'Okay now we know how to take this big,' so that's what we're going to do with Portal 2." Portal, Newell added, was "pretty clear, just internally" the best ever Valve game – and when the back catalogue includes legendary titles like Half Life, Half Life 2 and Left4Dead that's a pretty major statement.